Scientists at the University of North Carolina School of Medicine and UNC Lineberger Comprehensive Cancer Center say they have developed a technique for finding where DNA repair happens throughout all of human DNA. Their study (“Genome-wide analysis of human global and transcription-coupled excision repair of UV damage at single-nucleotide resolution”), published in Genes & Development, offers scientists a potential way to find and target the proteins cancer cells use to circumnavigate therapy, according to the researchers, who add that the benefit of this new method could be more effective and better tolerated classes of cancer therapeutics. The research, led by Aziz Sancar, M.D., Ph.D., the Sarah Graham Kenan professor of biochemistry and biophysics, reportedly marks the first time scientists have been able to map the repair of DNA damage over the entire human genome. When DNA is damaged, cells use many enzymes to cut the strand of DNA and excise the damaged fragment. 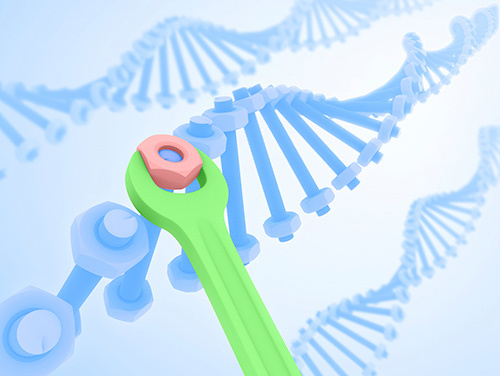 Then, other enzymes repair the original DNA so that the cells can function properly. Previously, Dr. Sancar's lab relied on purified enzymes to discover how this process happens in DNA damaged by UV irradiation and by chemotherapeutic drugs such as cisplatin and oxaliplatin. In recent years, Michael Kemp, Ph.D., a researcher on Dr. Sancar's team, found that a particular protein called TFIIH bound tightly to the excised damaged DNA fragment in the test tube. But for this information to be truly useful to biomedical researchers, the experiment needed to be replicated in human cells. Extracting a stable TFIIH-DNA fragment proved difficult. Not until postdoctoral fellow Jinchuan Hu, Ph.D., joined Dr. Sancar's lab could the team accomplish the task. Through a series of sophisticated experiments with human skin cells, Dr. Hu exposed the cells to UV radiation and used an antibody against the enzyme TFIIH to isolate the enzyme complex with the excised DNA damage. Then he created experimental techniques to pull the enzyme, as well as the excised DNA fragment it was bound to, from the cells. The fragment was stable enough for Dr. Sancar's lab to sequence it. Then, Sheera Adar, Ph.D., fellow postdoc, and Jason Lieb, Ph.D., co-senior investigator of the study used their expertise in computational biology to analyze where the DNA repair happened throughout the entire genome and thus generate a human genome repair map for the first time. Because UV radiation and common chemotherapy drugs such as cisplatin cause DNA damage in similar ways, Dr. Sancar's team is now using their new DNA excision repair method, known as XR-Seq, to study cells affected by cisplatin. They also hope to use it to study the biochemical reactions in animal models with the goal of finding the specific mechanisms that allow cancer cells to repair DNA damage to survive. “XR-seq and the resulting repair maps will facilitate studies of the effects of genomic location, chromatin context, transcription, and replication on DNA repair in human cells,” wrote the investigators. The research also revealed that parts of the genome scientists previously thought did very little are actually part of this repair process. On chromosomes, DNA forms genes that create proteins. Between these genes, there are DNA sequences.